DIN Standards are issued for a variety of components including industrial fasteners as Metric DIN 85 Slotted Pan Head Machine Screws. DIN 85 Screws are manufactured from Stainless Steel Acid Resistant A4, Steel 4.8, Stainless Steel A2, Nylon and brass. DIN 85 Screws are available in a wide range of sizes, shapes and materials. DIN 85 Screws are Fully threaded and can be used for many applications. German DIN 85 Screws are available with a larger head diameter and a slightly different head profile. 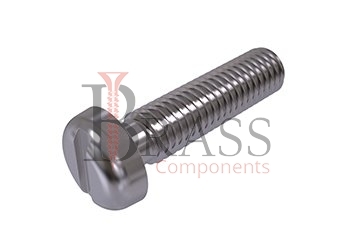 DIN 85 Standard Screws are available with semi-circular head with a dented straight type slot. The Class of metal is heat-resistant, does not magnetize, does not conduct current and is not toxic, which makes it possible to use it in various fields of activity. Complies with GOST 17473-80, EN ISO 1580 and ISO 1580. Strength class 4.8 and 8.8. DIN 85 Screws are externally threaded fasteners designed to be mated with threaded nuts or tapped holes in the parts they are designed to hold together. The semi-circular head on DIN 85 Screws serve for tight pressing of the fastened elements. The presence of a straight slot on DIN 85 Screw allows you to easily mount a metal product using a conventional slotted screwdriver. DIN 85 screw material protects the fastener element from corrosion in conditions of high humidity. 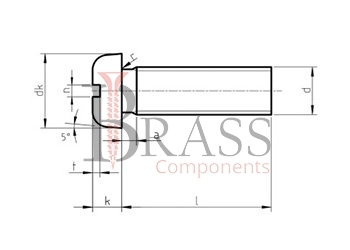 German Standard DIN 85 Screws are considered as to be Universal Screw. The wide range of DIN 85 Screws are used for connecting parts and components, in instrument engineering, mechanical engineering as well as other industrial and construction areas. DIN 85 Screws are used in other fastening, construction and production. German Standard DIN 85 Screws are used for connecting lightweight metal structures and various non-metallic material. General range of DIN 85 Screws are widely used for Wood or Plastic Products. DIN 85 Screws are widely used for Installation. We manufacture DIN 85 Screws as per Custom Specification and export in France, Italy, Switzerland, Poland, Greece, UK and other European Countries. For more Information, Please Contact Us or Inquiry Now.